Writerly Kit - Every Other Month Payment Option. Your themed boxes will be billed and delivered every other month, recurring. Themed content provides you with writerly motivation and inspiration for two months. Your first delivery arrives in an artisan crafted wooden writer's box followed by delivery in hand stamped kraft boxes. Ongoing access to Writerly Kits community included. Shipping is added at the check out. See FAQ. As we grow, we look forward to passing on even more shipping savings to you. Image shows some of the contents of our very first box. Want more details of our past boxes? Peek here. 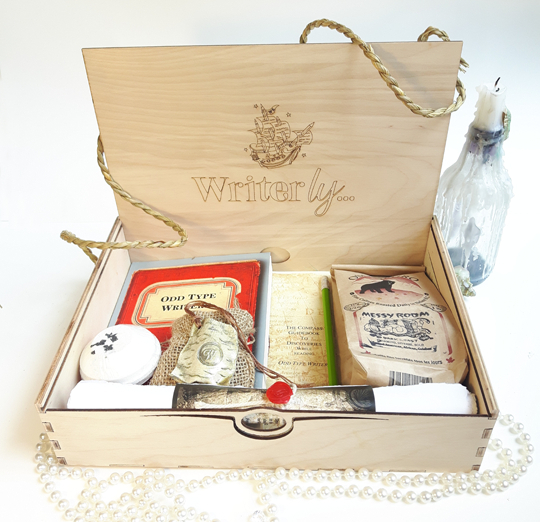 Note: Subscription boxes are an ongoing recurring service for your convenience (and for your writerly inspiration!) Please know you are able to unsubscribe easily at any time. Please read info in FAQ to learn more.